Spring is almost here and there’s really no better place for observing it in its full bloom than at the garden of The Netherlands, Keukenhof. It’s not an excursion we do frequently. The Dutch of us, Lydian, has in fact never even been here until our first visit. For the Amsterdam expat, Pal, this was the first re-acquaintance after the first visit some fourteen years ago. 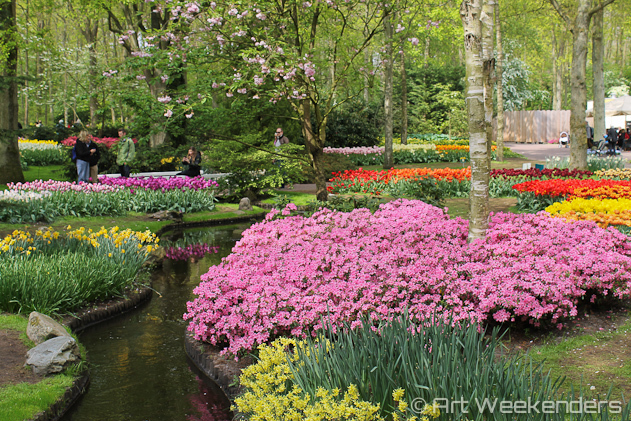 Thus, about time to check it out: Keukenhof, tulip fields and a bit of Dutch history. 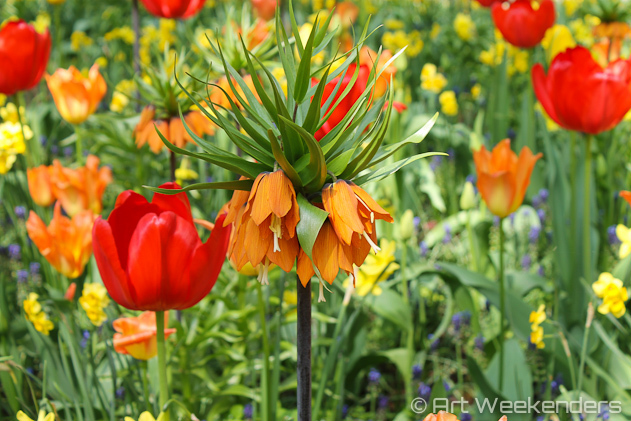 Mainly interested in the practical details of a Keukenhof visit? Just jump ahead in the article here. 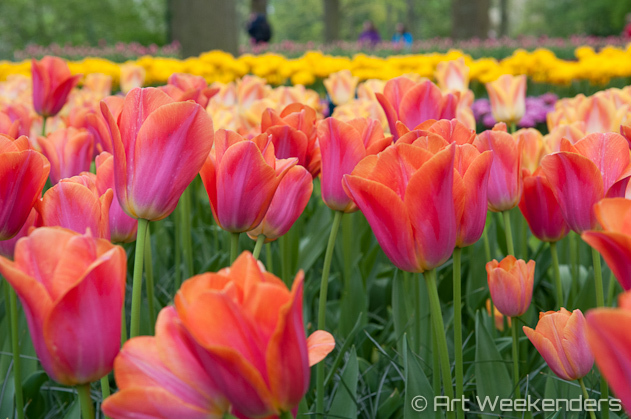 One of the many beautiful variants of flowers in Keukenhof, Lisse, The Netherlands. Keukenhof Gardens, Lisse, The Netherlands. 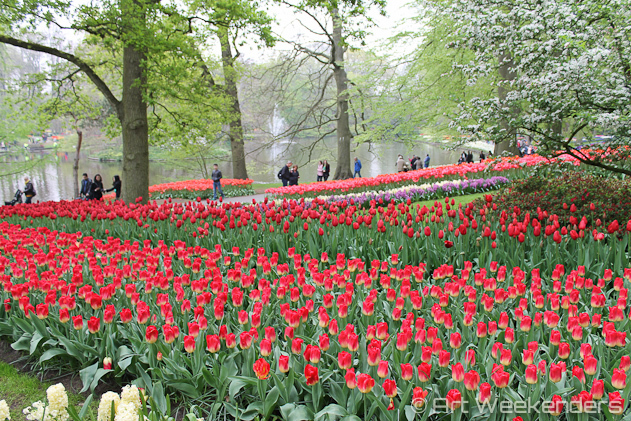 Ask most Amsterdammers, or any Dutch person in general, if they’ve been to Keukenhof, the Garden of Holland. Quite likely you’ll be met with intriguing eyes asking if you take them for some tourists. Somehow it remains one of those typical things to do in the Netherlands for visitors, but what the locals tend to avoid. Or is it really the case? Maybe it’s even one of those secret pleasures, but we who live here just don’t talk about it? Flower fields near Keukenhof, Lisse, The Netherlands. Flower fields in Keukenhof, Lisse, The Netherlands. The reasons for the usual reservation is definitely not related to a Dutch rebellion against their beloved blooming bulbs that flood the global markets every year. It’s a flower-loving nation, some of the highest spenders per capita (and then a nice bouquet is still fairly cheap here) and there will be tulips and other blooms everywhere. 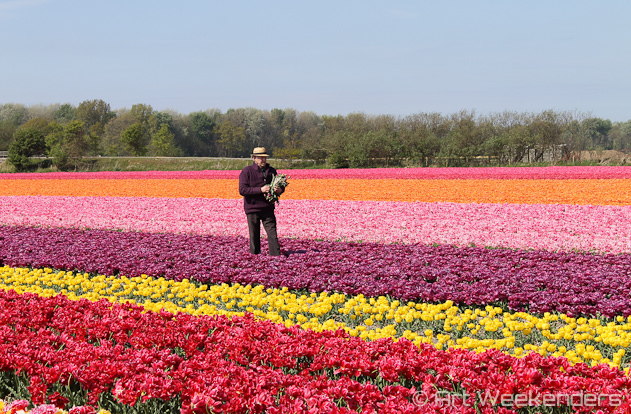 The objections come from the fact that going to Keukenhof sounds like a quite hectic endeavour, with busloads of tourists invading the 32 hectares reserved for this colourful spectacle. Since the yearly “lifespan” of this annual explosion in colours is just some eight weeks, it does indeed get very busy here. But it’s touristy for a reason, the experience is unique and absolutely beautiful. Tulips in the Keukenhof, The Netherlands. The relationship of the Dutch to this symbol of the country, the tulip (we’ll get to the clogs, cheese and windmills too at some stage, no worries), is an intriguing one. In many ways it tells a lot about the national character. The tulip bulbs are certainly not indigenous to the Lowlands, rather reached the Dutch shores from Turkey and Asia Minor, but actually via Vienna. The man behind it all was a certain Carolus Clusius, a botanist from the Dutch city of Leiden. Clusius was one of the foremost plant collectors and enthusiastic scientists of his field in Europe of the time. The ambassador of the Habsburg Emperor Ferdinand I in Constantinople brought back bulbs to the Viennese court and the flowers soon gained in popularity. Clusius, expert networker as he was, soon was gifted a few bulbs, which he took back to his hometown of Leiden in 1593. 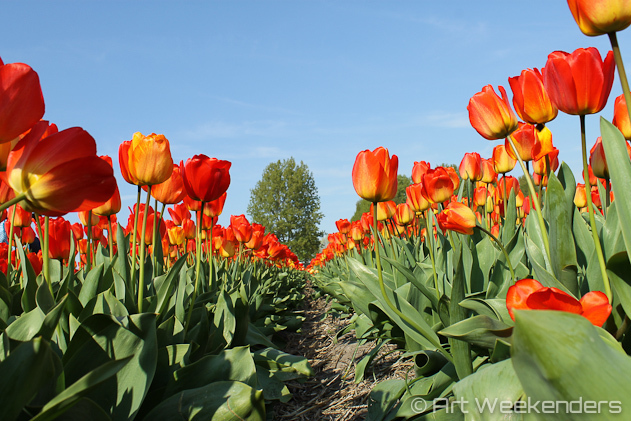 The botanist took his profession seriously and soon the tulip bulbs spread across Holland like a wildfire. 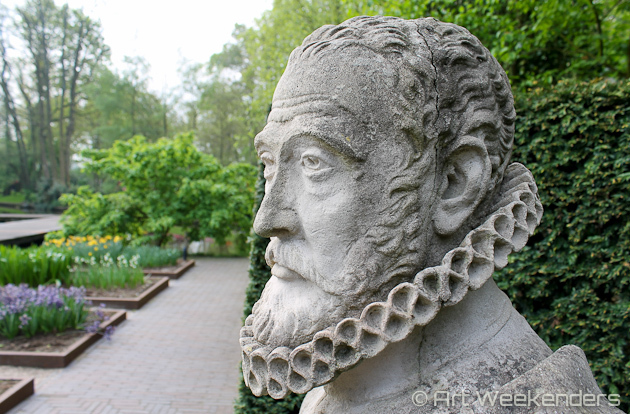 Statue of Carolus Clusius, Keukenhof, The Netherlands. 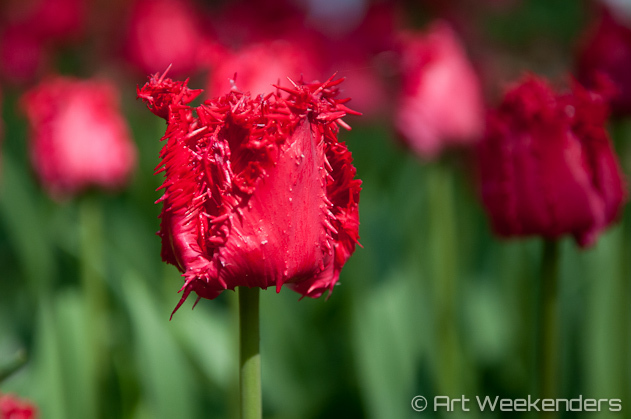 One of the many special variants of tulips in Keukenhof, Lisse, The Netherlands. By the early 17th century the first steps to what later turned into the biggest horticultural industry in the world were taken. Cultivation of tulips in the fields around Leiden took off dramatically and tulips became immensely popular. In the beginning it was natural that the flowers became an exclusivity and due to its scarcity they immediately became a status symbol among the Dutch nobility. No surprise then that the cultivation of the bulbs became an attractive alternative to growing vegetables. The outcome? The price for the bulbs soared and soon enough the gardens of the area were brimming with tulips. 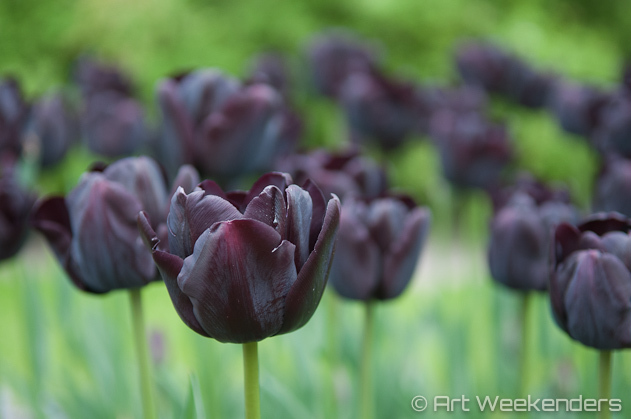 Almost black tulips in Keukenhof, Lisse, The Netherlands. In search of exclusivity a new industry developed. What was first a hobby became a science: plant breeding became one of the most lucrative professions and new varieties kept evolving, where the stripy versions became the most in-demand sorts. High demand and attractiveness led to the development of another business: professional flower trading. The Dutch are good traders, thus not surprising that tulips caught on so dearly in the Lowlands. Dutch merchants always have eyes for new business opportunities. Because tulip bulbs were a commodity that could be traded without the physical presence of the bulb – in fact, even without having it available for months – the world’s first ever financial futures market evolved. People were trading in bulbs like professional gamblers. Since prices went up, and than even more up, people easily invested their entire fortune in this seemingly bottomless wealth. It turned out though, that the world’s first ever speculative bubble was created and many dreams with them. The ‘tulipomania’ – lasting from 1634 to 1637 – was a fact. Tulips in Keukenhof, Lisse, The Netherlands. Name the bubble that lasts. No-one knows exactly what really happened, but likely due to the outbreak of a bubonic plague in the Dutch Haarlem and the ensuing inheritance-related family feuds, panic started to spread and the bubble burst. The complicated contractual obligations – futures, spot contracts, you name it – created havoc and the market collapsed. Today there are those who claim that all these stories are wildly exaggerated. Nonetheless people still like to talk about it – nothing beats a good story, that’s just how it is. Not only the stories lived on. 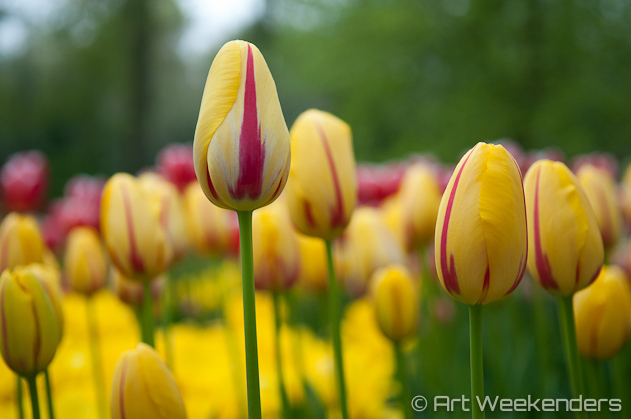 Tulips and other flower bulbs became an important part of life in The Netherlands ever since, turning the country into the biggest producer and exporter of flowers in the world. It’s quite fascinating studying the figures around the flower trade and reflecting over how this small country can be so dominant in the world of flowers. The Netherlands produces almost 4.5 billion tulip bulbs each year and more than half of those are grown into cut flowers. This little country has more than half of all the trade in flowers in the world. If we consider trade in flower bulbs only, the share is an astonishing 80%. Each day 35 million flowers and 2.3 million plants are sold on Dutch flower auctions, spread over 120,000 daily transactions. 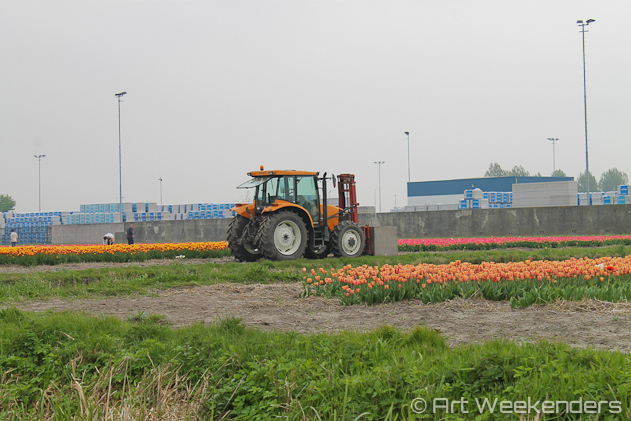 Work in action on the tulip fields near Lisse, The Netherlands. As we know, The Netherlands is a small country and if we also consider that most of the production is taking place in just a small region of the country, the figures are even more overwhelming. This region stretches between Haarlem in the north and Leiden, some 50 kilometres further to the south and it has its touristic epicentre in Keukenhof, just outside of Lisse. 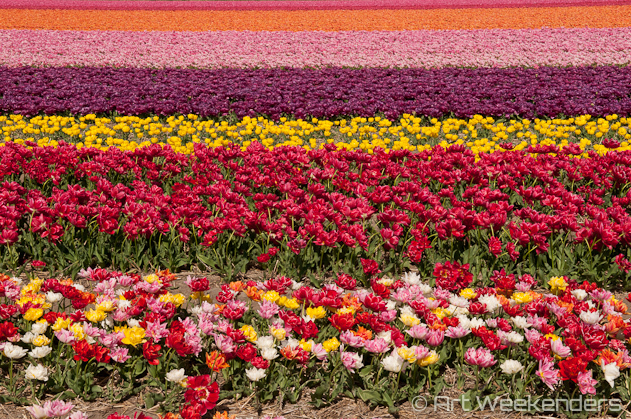 Colourful tulip fields near Lisse, The Netherlands. Tulips didn’t only find their ways into the business world. Already soon after its arrival to the country and especially during the tulipomania years, flowers became part of the art world as well. Since the flowers quickly became a symbol for every well-respected home and the garden’s attached to them, it’s no surprise that flowers became a favourite motif for artists too. The famous Dutch still-life isn’t just a co-incidence. Today one of the best places to see the great production from the Dutch Golden Era is by visiting the Frans Hals Museum in Haarlem, the northern-most point of the Bloemen Route‘. Here you will be able to see works by van Goyens, van Dijk, Cornelisz van Haarlem and many more. 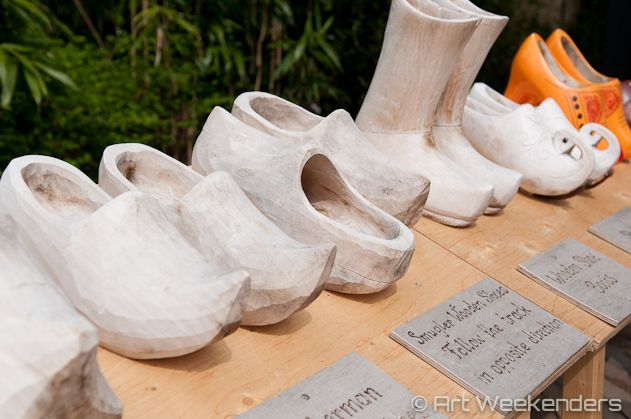 Also at Keukenhof art has a prominent role. 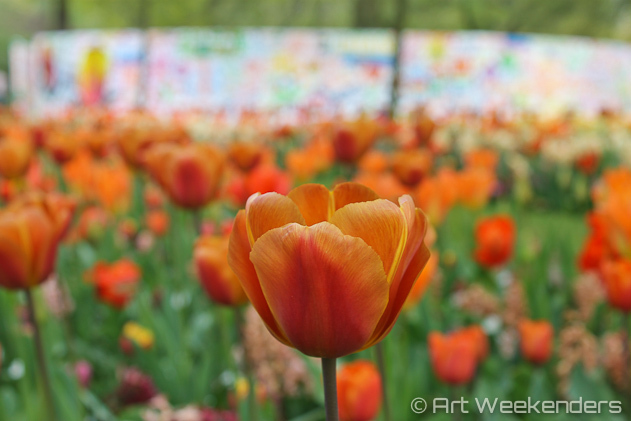 There are regularly special events arranged, like at the beginning of May 2014 when 50 artists were visiting the garden and painting live in the Willem-Alexander Pavilion. The garden is also the permanent home for many statues, with emphasis on Dutch works. 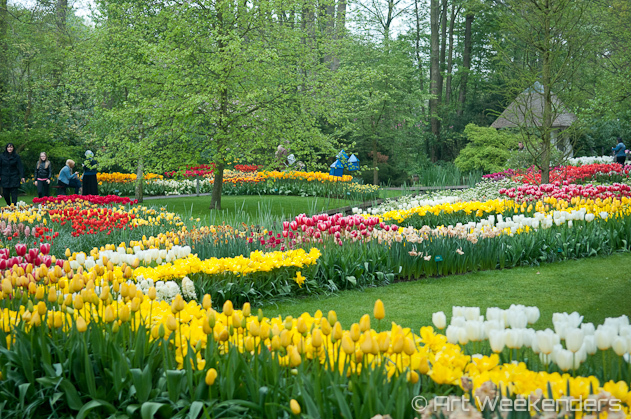 Keukenhof Gardens were established first in 1949 as per an initiative by the then-mayor of Lisse and some local flower bulb growers as a platform to market their produce. The first exhibition of 1950 turned into a big success, people simply loved the show put on display, and ever since the yearly event only kept on growing in popularity. Today during the eight weeks the 32 tulip-filled hectares attract some 800,000 visitors, meaning that almost 2,000 people are entering the park every hour. Thus, no wonder that it gets busy here. However, once you pass the main entrance and the crowds (which inevitably will be there), it gets definitely less hectic, easier to enjoy. The show put on by the millions of tulips will easily distract you from any human intervention. But of course, you won’t be alone and occasionally, rest assured, you will be reminded about others existence too – but it’s all about having patience. Beautiful flowers in Keukenhof, Lisse, The Netherlands. The park is well-organised, it is easy to walk through it thanks to the accessible walking paths everywhere. 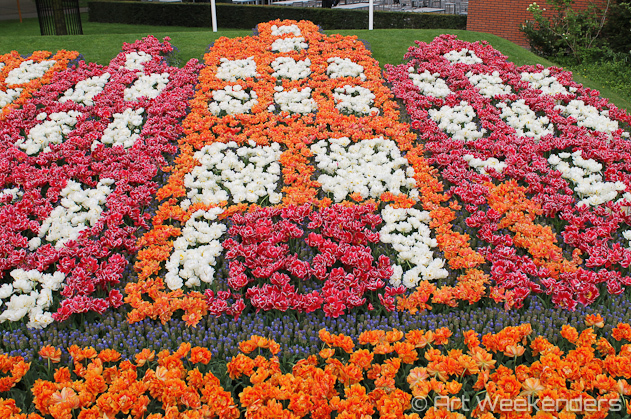 While the neatly organised flower enclosures are the main draw of the park, there are also five indoor pavilions, all of them named after the Dutch royalties: the new king Willem-Alexander, old queens (Juliana, Beatrix, Wilhelmina) or the entire royal house of Oranje-Nassau. Inside them you’ll find even more exhibits, but also restaurants (count with prices some 30% higher than inside the Dutch city centres) and other facilities. Boating through the canals among Keukenhof tulip fields, Lisse, The Netherlands (see below Guided Tours). 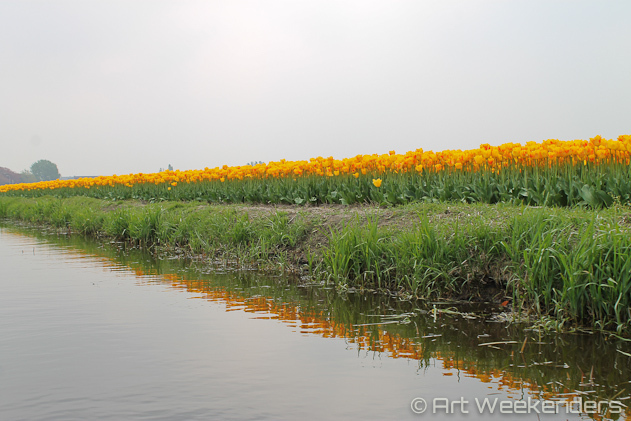 View while boating near Keukenhof, Lisse, The Netherlands. The name Keukenhof – meaning ‘kitchen garden‘ in Dutch – originates from the neighbouring castle with the same name. The ground, where half of the park is, used to be a 15th century hunting ground, but also a herb garden, hence the name. If you are familiar with Amsterdam’s famous Vondelpark you might notice certain similarities. The same landscape architects are behind both. During the years the park expanded. Today a pond divides it, where the northern, a bit more hilly part is the original ground and the southern, younger looking area is the extension. For us personally, the old grounds had a slightly higher appeal, but this can also be due to a sunny afternoon after a more cloudy morning on the lower side. 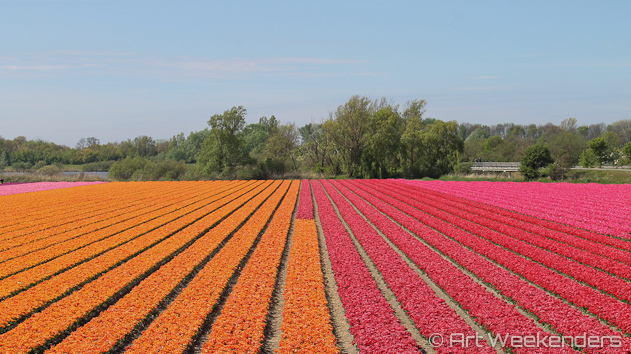 After rounding the day off with a bike-ride to the fields and wandering among the spectacular lines of tulips, it was easy to wonder why we didn’t come there earlier. Yes, we can conclude that it certainly is touristy, but it’s also a great and beautiful experience. The crowds? Well, it’s easy to overlook them once you start enjoying the flowers and take it for what it is: a popular place attractive for many. It certainly is a great pleasure experiencing it, and really, no need to be secretive about it, even for us locals. For the independent traveller the options of getting to Keukenhof are fairly straight-forward. If you are coming from Amsterdam, your journey should only take just a bit more than half an hour, depending on the traffic. The 30 kilometres route to Lisse is usually an easy ride. You have to drive towards Schiphol Airport and from there it’s just some other ten minutes. If you’re coming from Rotterdam the drive is about the double, and from Leiden or Haarlem it’s just some 20 kilometres. Keukenhof has parking facilities and usually no problem finding a spot, for € 6.00 you can stay for the entire day. From Amsterdam the best option is to head to Schiphol Airport either by train from Amsterdam Centraal or Zuid/Rai or by Bus 197 from Leidseplein or Museumplein. At Schiphol Airport change for Bus 858 that takes you to the Keukenhof gate entrance. The bus generally runs every 15 minutes from the airport, and on weekends they even put in extras. It’s a popular route, so it could be that you’ll have to let one or two buses go before you can safely sit on board towards your flower experience. For public transportation schedules – as always with Dutch public transportation – consult the excellent 9292.nl. To make it easier and more convenient for yourself, buy a combination ticket including public transport and Skip the Line Keukenhof entrance ticket in advance online. This will safe a lot of hassle and time queuing. From Leiden the procedure is similar: take Bus 854, departing from Leiden Central Station. You can’t buy your transportation tickets on the Keukenhof bus, thus prepare your trip in advance. If you are in the possession of the Dutch public transport pass (OV-chipkaart), everything is as normal, it’s like travelling anywhere else in the country by checking in and out with this pass on the bus. Sure, why not? Just take your bike to Leiden on the train and bike from there. Yo are allowed to take your bike on Dutch trains outside peak hours (thus, not between 6:30-9:00 and 16:30-18:00) and a daypass for your bike, indifferently of the distance, costs € 6.00. Thus, for instance Amsterdam-Leiden return will cost you € 17.60 + € 6.00 = € 23.60. If you have the OV-Chipkaart the train journey is 20% less. The distance Leiden-Lisse is some 17 kilometres, thus nonstop that should mean an hour’s ride. Flat-tire excluded, of course! 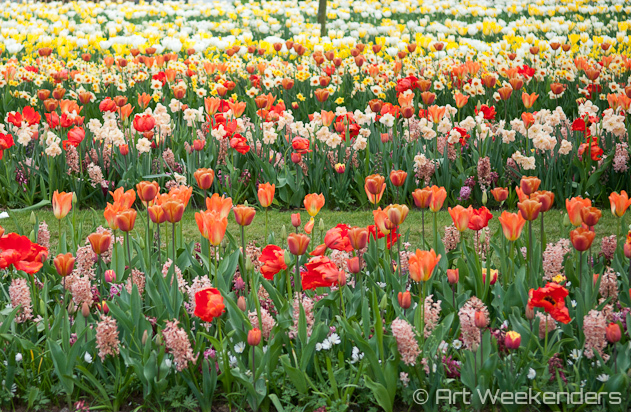 Colourful flowers in Keukenhof, Lisse, The Netherlands. There is one guided tour each day, starting at 2 pm, with one of the friendly, good-natured and entertaining locals. 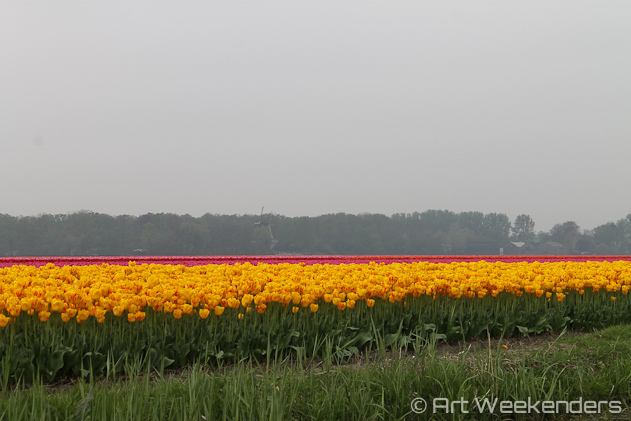 These tours are free of charge and they give you a good idea not only about the park, but also about its history, tulips and The Netherlands in general. The tour lasts 90 minutes and it takes you around the entire 32 hectares of the park. It is pretty busy – it’s free, remember – and can be a bit hectic. If you’ve spent your morning walking around, this tour might not be for you. But if you just got there around lunchtime, head straight to the ‘Bulb Information Pavilion‘. Tours are in several languages, depending on demand, and English is always guaranteed. 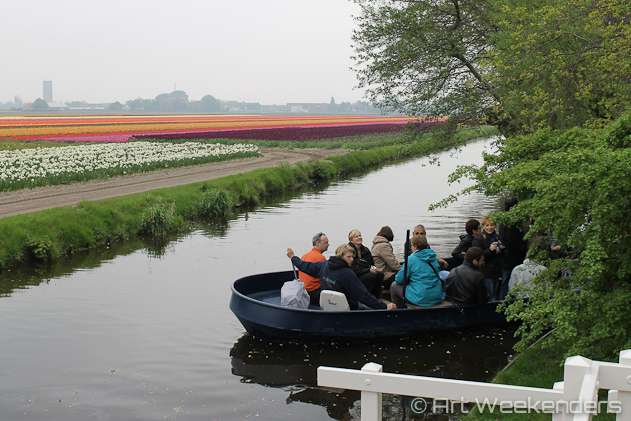 A fun way of adding an extra twist to your Keukenhof-visit is to visit the surrounding fields by boat. The tour takes 45 minutes, and it’s a nice way of resting your legs. You won’t leave the boat, but you can enjoy the surroundings, which especially on a sunny day can be stunning. 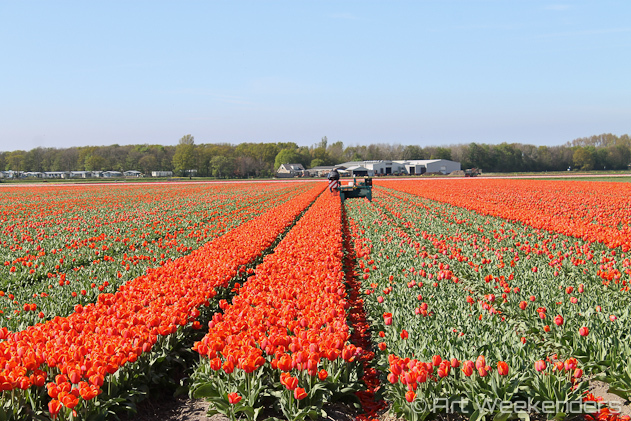 The best time is to go during the first half of the opening season, thus around early April – usually there will be more fields in bloom than later on. But don’t worry, there always will be some and it’s quite special seeing it from the water, especially if you are not experienced with Dutch canal-life. Another added benefit is that the boats are quiet (running on electricity from renewable sources) and what you will hear the most is actually the bird-life at the shore of the canals. The boats leave from the windmill (eastern end of the park, you won’t miss it) and it costs € 8.00 per adult. Advance bookings are not possible. Expect to wait a bit, it normally gets busy there, especially on a nice sunny day. Make sure to pick up headphones for the audio-guide, surprisingly insightful and especially worth it if you won’t join the guided walking tour. So you don’t like the crowds and you’re ready to get away from it all? You can. However, don’t expect to see the same things as inside the park. But you’ll see so much more, in piece and quiet, while enjoying one of the Dutch favourite pastimes: biking around the countryside. As most, you likely won’t come to Keukenhof by bike, but no worries, right outside the park you can rent bikes. Not only do you have the option to rent regular bikes, but for the romantics out there – or just for the fun of it really – there are tandem bikes available as well. If you want to make sure there is a bike available at the day of your arrival, make sure to book your ticket ahead. 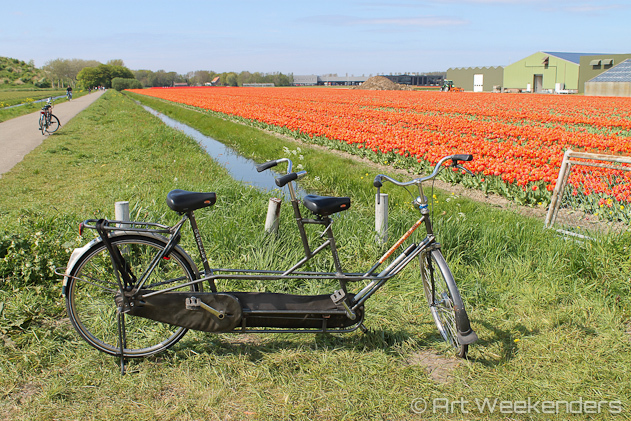 Biking a tandem around the tulip fields near Keukenhof, Lisse, The Netherlands. Colourful tulip fields near Keukenhof Gardens, Lisse, The Netherlands. You even get a map with different routes to follow and then it’s just to hit the bike-lanes. Not only will you have your peaceful moments, you will also have the best tulip fields almost all for yourself to photograph. Highly recommended! 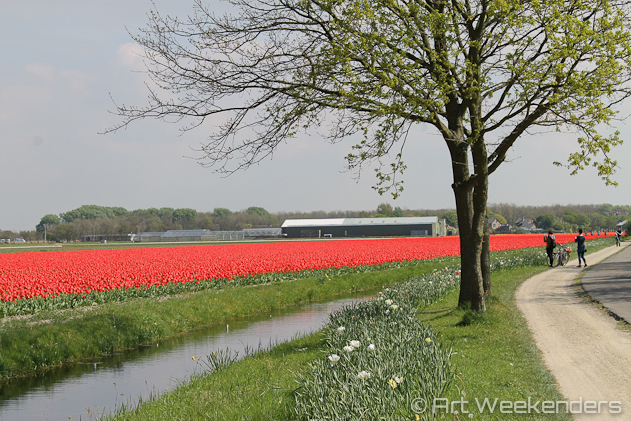 If you’d like to see a bit more of the area, a perfect way of doing so is to drive along the Bloemen Route, Holland’s own Flower Route. The route takes you from Haarlem in north to Naaldwijk in the south, some 75 kilometres to the south, with Keukenhof right in the middle. Naaldwijk is the world’s largest greenhouse area, and famous for its flower auction house (guided tours available). Flights: certainly not for everyone, but if you would so fancy you can also take in the area from the air. An alternative is to take the window-seat on your flight to Schiphol, but that’s not what we mean. You can instead book an approximately 30 minutes flight tour from Schiphol over the Keukenhof region with all the amazing fields. Currently Ticketbar offers flights, including bike rental, public transportation and entrance tickets, so you can basically spend all day in, around and above the Keukenhof, tulip fields. 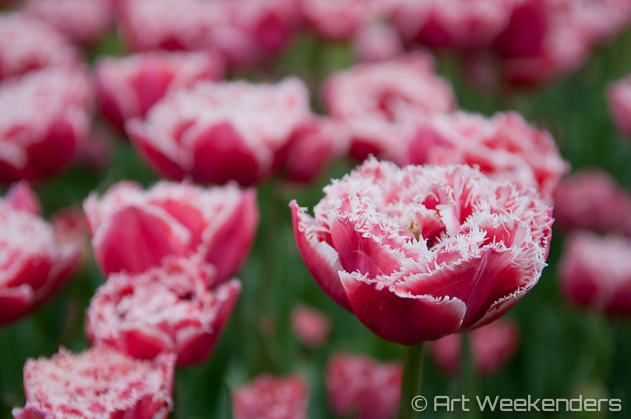 This year (2018) the Keukenhof will be open from 22 March until 13 May. 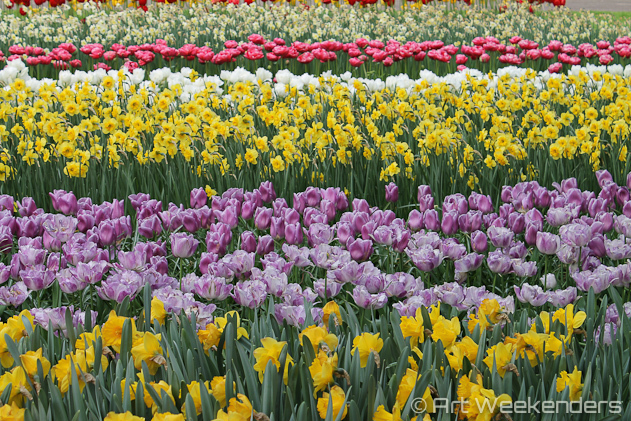 The park is usually open from mid-March until mid-May (check the Keukenhof website for the exact dates). Is it always equally good to go? Well, almost. While we can’t predict the weather, we can certainly say that it can impact your experience. To catch most fields in bloom best time is to go at the early part of April. Let’s say April 10th… Ish. What we mean is that in March it can still be fairly chilly, but in May the season is coming to the end, especially valid for the fields. Inside the park it matters less when you go, the park is managed by professionals who know how to make the flowers bloom just for your visit. Thus, even in late May you’ll find most lots in full colourful bloom. As we mentioned above, the Keukenhof can get crowded. If you would like to skip the lines at the entrance and rather spend your time within the tulip fields than in the queue, buy your Skip the Line entrance tickets online in advance. Just outside the parking lot where the buses arrive, across the road, there are some tulip fields you can walk into. It is a bit busier than if you would bike out to the more remote fields, but certainly worth the short walk. They’re some fantastic fields really. Lisse is maybe not the reason why you’re coming here, but if you have the time it’s worth checking it out, it’s pretty quaint. The Keukenhof Castle is worth checking out, it’s just across the road, hidden in the lush garden attached to it. Would you like to see even more pictures? Head over to our partner-site Shoutography. 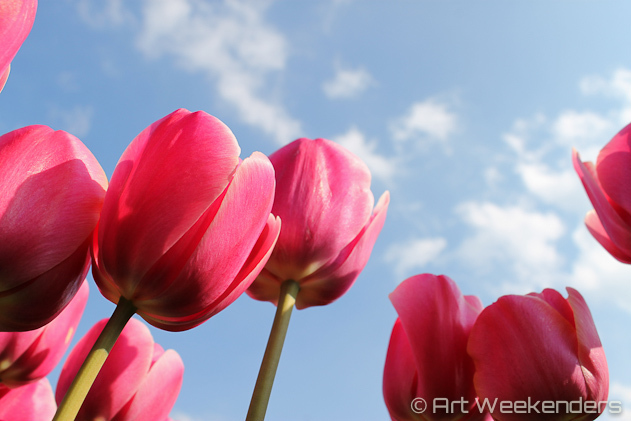 Do you have specific questions about Keukenhof, tulip fields or Amsterdam? Just get in touch, we’re happy to help! Disclosure: We were guests to Keukenhof Gardens, but all opinions shared here are totally our own.